In this episode, a sneak attack from a renegade tamer draws Tai and Agumon into a fight for their lives. Good thing this was before he grew too scared to lay waste to everything. In the middle of all the excitement over tri., a new short featuring eleven-year-old Tai and Agumon was a surprising treat. Yes, like most of the Digimon movies, trying to figure out where it goes in the timeline causes headaches. Yes, even those half-hour “movies” seem extensive compared to this. 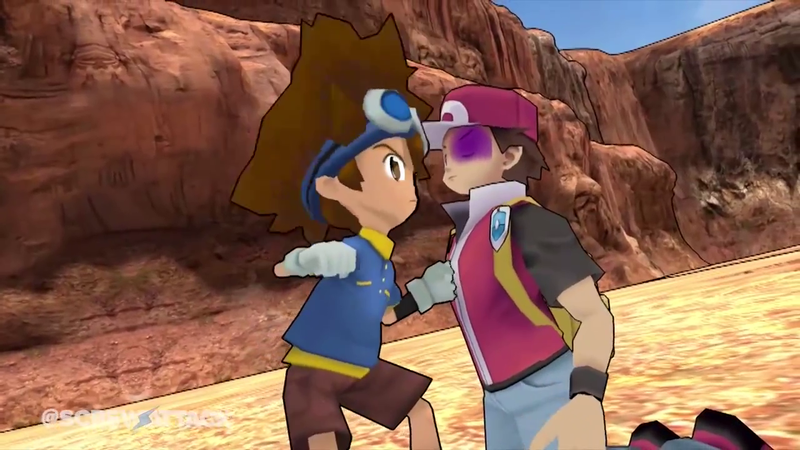 Yes, the animation is a little odd and bears a closer resemblance to the PSP game than the series itself. It still looks better than X-Evolution. Meanwhile, it pulls us back to the good old days when the goggles still did nothing, when Tai was still a little naive, and when we could still use dub terms with impunity. It'll never get top marks, and its status in the canon is only slightly less dubious than the first Zero Two movie, but it's important in understanding Tai's character as we perceive it in tri. Clearly, the timing of its release was not a coincidence. The plot is minimal, but still compelling in a way: a mysterious boy tries hunting Agumon, leading to a fight that escalates to a fatal degree. We don't get a lot of information on Red; we don't even know whether to call him a tamer or a hunter (those are really the only two options). At the same time, his passion to add Agumon to his team, even after it puts him at odds with Tai, is sort of admirable in a way. It's easy to label him some sort of Ken-like villain, but the closer approximation may be Christopher: he knows what he wants and will go to dramatic lengths to get it, even if it paints him as the bad guy. In another world, that may not be so awful. Look at it this way: Red fights like a proper tamer, and it's hard to demonize that. He shouts orders to Charizard, utilizing his full skill set to give even Agumon's evolved forms a run. You half-expect him to start slashing modify cards the way he commands his partner. He also has the power to allow Charizard to Warp Digivolve to MegaCharizard. That requires a strong bond with a Digimon; they don't just pass that power out to anyone! Red matches Tai toe-for-toe as a proper rival, and should be appreciated as such. You could argue the role could be served just as well by finally getting Neo Saiba on screen, but for a new character, Red gets the job done. In the end, of course, the story is about Tai. He's the hero, and as much of a challenge MegaCharizard can offer, he's no match for WarGreymon. The point of the whole thing isn't to see who's going to win. That would be ridiculous. It's about how quickly a confrontation can escalate and how dire the consequences may become. Think of it as the whole message of Data Squad reduced to six minutes. Tai even punches someone! Tai also has to face the reality of how it ends. He desperately, dramatically takes down Red, which freezes MegaCharizard, who is conditioned to obey his tamer and not act on his own. WarGreymon isn't so restrained and ends the fight in no uncertain terms. Tai wins, but in doing so he and WarGreymon kill not only the Digimon, but the human as well. Tai started fighting so quickly he couldn't tell whether Red was truly good or bad. He'll never get the chance to find out. Given when the short was released, it's easy to put the signs together: this is the key moment that helped shape Tai from an eager youth to the more gunshy teenager we see in tri. When someone like Alphamon, whose allegiance again in uncertain, shows up, it's easier to imagine why Tai would hesitate to fight him. He's already seen what happens when lured into such a battle, and will do anything to avoid that same ending. In many ways, killing Red finished off what was left of Tai's innocence. Ow... his childhood. Anyone else curious how Red's ball contraptions worked? 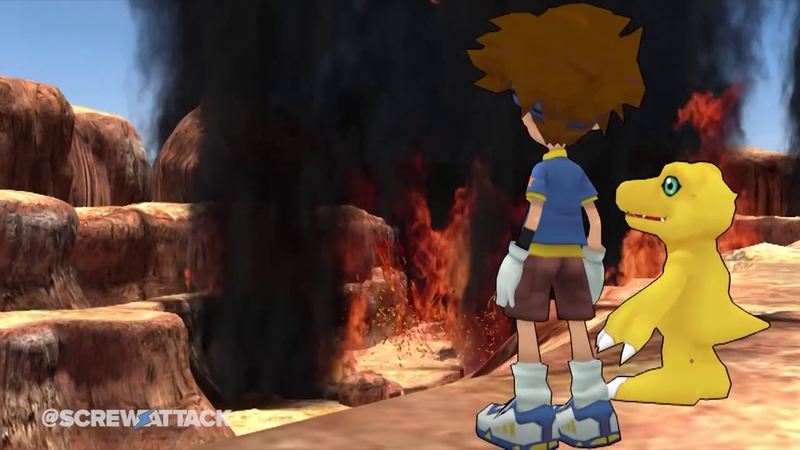 It seemed to serve as both a home for his Digimon, similar to the storage capabilities the digivices in Data Squad and Fusion had, while also acting as a projectile weapon to aid the hunting process. I'd like to think it's also a nod to one of Arata's lines in Cyber Sleuth. Either way, it's fascinating, especially how little it was utilized. Cute that Agumon roasts marshmallows the old fashioned way instead of using his Pepper Breath attack. Another curiosity is that Charizard (and MegaCharizard) don't follow the -mon naming convention. Again, not unprecedented (see Rhythm in the Savers movie), but it's curious. I personally like it as it adds a bit of other-worldliness to these guys, who really do seem to come out of nowhere. Tai's punches and kicks on Red get locally censored, but they still show MegaCharizard getting beaten to a bloody pulp. Even Red's shown to be in pretty bad shape by the end! Silly dub. Yes, he was clearly a one-shot character, but you can't help but want to know more about Red. For an antagonist, he cared about his partner and fought very bravely. There's also those weird idiosyncrasies like some of the terms he uses and his confusion that Tai would fight to protect his partner. Just saying that if they ever made a movie, or even a series of them, outlining his backstory, I'd watch the hell out of it. Interesting review. I got a few videos that are fan made which you should disect. Also you should totally do the video games.